Development of any nation is determined by so many factors. One and important factor is health of the population because a healthy population can work effectively towards a national development. Even though it is costly and hard to develop nation within a short period of time, soon after independence the Eritrean government has worked tirelessly to make the national development upright. After independence rebuilding a war torn nation lacking of basic social services for its people became the first task of the Government and People of Eritrea, mainly, on health, education and food security. Taking health as an important concern and a fundamental avenue for national development, the government started to work hard from the early years of independence by settings many exertions towards health. Diseases are taking millions of lives in different societies of the world having an impact on the global labor force. Especially, the Global South is left in poverty putting governments under dependency towards the international community to overcome health challenges. However, in Eritrea, the Government, the Ministry of Health and their associations showed massive engagements in controlling communicable and non-communicable diseases as a national priority. Malaria is one of them. About 3.2 billion people remained at risk to malaria attack globally, as WHO reports indicate. In regards to malaria, Eritrea categorized the infectious disease as an issue of utmost national concern. Significantly, approximately 70% of the population inhabits in endemic, high-risk areas, with the Gash Barka region bearing greater than 60% of the burden. Of note, the most common malaria parasites found in the country are Plasmodium vivax and Plasmodium falciparum. The former leads to severe disease and death, while the latter is the deadliest species of all malaria parasites infecting humans. 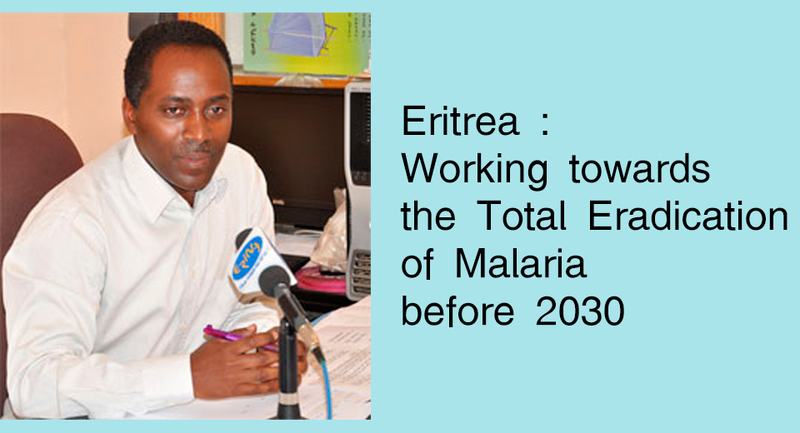 To control malaria, Eritrea has employed an assortment of strategies, including the promotion of national campaigns and community based-programs. Many programs have focused on providing extensive awareness and information, organizing focus groups, using preventative interventions, and encouraging the use of medical check-ups and medication. As well, control strategies have incorporated early treatment, indoor spraying, a focus on drainage and larviciding, mass distribution of insecticide-treated nets (ITNs), and a variety of source reduction efforts. Eritrea’s approach to immunization and vaccination has been based upon a group of cooperative agreements with various international organizations and partners, including the United Nations Development Programme (UNDP), UNICEF, the WHO, and the GAVI (global alliance for vaccine and immunization) Alliance. These partnerships have increased supplies such as vaccines, syringes, and vitamin A capsules, while strengthening support for the development, production, and dissemination of social mobilization materials, regional plans, and logistics. Notably, Eritrea’s impressive results in 2012 and 2013, Eritrea’s measles coverage was 99%, well in advance of its neighbors: Djibouti was at 83%, Ethiopia at 66%, Somalia at 46%, Sudan at 85%, Kenya at 93%, Uganda at 82%, and Africa at 73%. As it’s mentioned in the above controlling and eradicating of malaria is the ultimate goal of the ministry, as a result the ministry is in continues struggle to put as much effort to make its goal successful. Head of the malaria control/ elimination project Mr. Selam Mhretab said that out of the six zobas, Central and Southern Red Sea are the two Zobas besides villages and sub-zones which are located around the coastal area in which malaria disease is almost eradicated because of the their temperature. He indicated that the struggle to control malaria shows result in which death incidence decreased by 90%. By keeping this record the ministry has plans to control malaria from 2017 up to 2020, pre-eradication from 2021 up to 2023, at last eradicating malaria totally from the year 2023 up to 2030. Mr. Selam said that based on the studies which has been done in the past months, in the year of 2012 the usage of malaria nets were 60%, however nowadays it has decreases to 30 % as a result he recommended to increase the use of malaria nets in every season. He added that health centers are ready to give health services to the community, if anyone sees malaria symptoms, especially high fever, one should go to the nearest clinic for a checkup within 24 hours as well as take the medicine prescriptions properly while ensuring great focus in the hygiene and sanitation of one’s environment. In addition, “talk to your doctor about how to prevent malaria while traveling. You may need to take prescription medicine before, during, and after your trip to prevent malaria, especially if you are visiting low-altitude areas”, Mr. Selam said. It is know that Malaria is a communicable and spreadable disease, thus giving this fact the Ministry of Health with its stakeholders are actively engaged in combating this disease. Consequently, similar to previous years, in the year 2017 materials needed to control malaria were provided to nurses and other concerned bodies at the Ministry. Parallel, awareness raising activities are underway allover health facilities in the country in collaboration with the Ministry of Information. Mr. Selam said that, yearly the Ministry of Health gives Insecticide-Treated Nets (ITNs) to those located in risky areas and pregnant women. However, controlling malaria disease is not a work to specific bodies of the government. And even though the awareness of a society towards malaria disease is increasing now and the number of occurrence has to be to the least figure. As a recommendation Mr. Selam said that sanitation, taking treatment properly per doctor’s orders, regular check-ups in the nearest health centers and using Insecticide-Treated Nets (ITNs) in humid areas favorable to mosquito reproduction will make the overall hard work undoubtedly a success.